The first aircraft purchased by the NACA in 1929, the Fairchild FC-2W2. 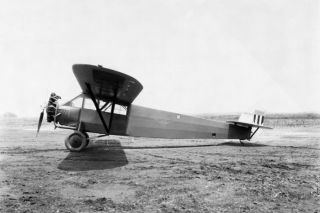 In this historical photo from the U.S. space agency, the first aircraft purchased in 1929, by the NACA was this Fairchild FC-2W2. Marked as "NACA 26," this aircraft was the first to be flown in a NACA paint scheme. The colors applied to this Fairchild were blue fuselage, silver wings and tail. The wing had a yellow stripe down the middle, from tip to tip. A red, white and blue shield was added to the rudder. It was used by NACA in an effort to correlate wind tunnel and flight aerodynamic characteristics.